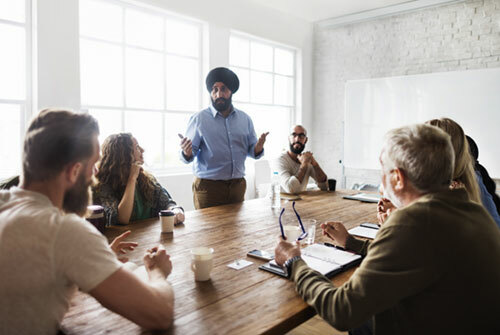 In order to successfully lead an internal meeting, presenters must excel in three core competencies: audience analysis, narrative organization and executive presence. Vocable offers consulting to help individuals perform audience analysis to identify the level of understanding, values and potential resistance points of audience members, organize content in a way that captures the audience and speaks to their concerns, and command the room in order to persuade and inspire them. Meetings are crucial to all organizations, from small businesses and non-profits, to large corporations and political campaigns. Audiences, especially those containing diverse ranks and functions, need to understand quickly the purpose, main goals and value of information being presented in any meeting. The responsibility for engaging and persuading audiences falls upon the presenters, who must craft content and visual aids that produce excitement and buy in. Vocable consultants offer training that allows leaders to do just that. For more information on our internal meeting services, email us at info@vocablecommunications.com.